As we move into 2018 during year two of the Bhakti-tirtha course, our residential students have comfortably settled into the two-track program. 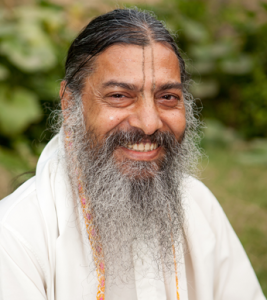 Track one consists of classes by Satyanarayana das Babaji; this year we are focusing on Bhakti-rasāmṛta-sindhu, eastern division, chapters 2-4, and Alaṅkāra-kaustubha by Kavi Karnapur. Track two is Sanskrit, taught by Jagadananda das, and consists of both level one and two classes. Sanskrit classes at Jiva Institute are not mandatory but the students as a group have developed a clear vision of how Sanskrit instruction is key to the mission of Jiva Institute. Babaji’s main service here is to translate and publish Gauḍīya Vaiṣṇava literature, specifically the work of Śri Jīva Gosvāmī. Another scholar based here, Dr. Demian Martin, focuses on the unpublished works of Śri Baladeva Vidyābhūṣaṇa. The amount and depth of serious scholarship needed in the Gauḍīya Vaiṣṇava community ensures that there is practically unlimited work to be done in rediscovering, translating, publishing, and preserving the works of previous Vaiṣṇava scholars. For this work, a team of dedicated and highly educated Vaiṣṇava scholars is essential. 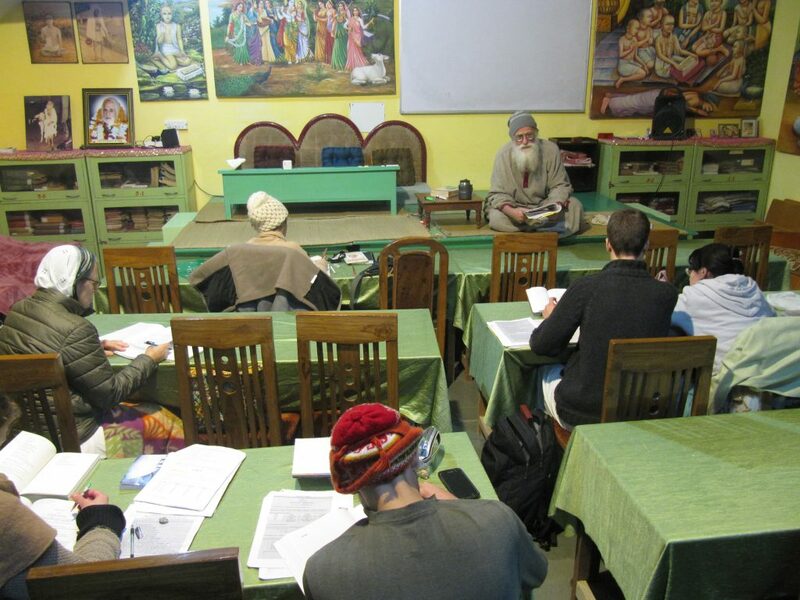 Babaji is providing residential facilities and free instruction to interested individuals who are able to devote six months a year to studying both Sanskrit and śāstra. Aside from the need for competent Vaiṣṇava translators, both Babaji and Jagadananda prabhu suggest that to correctly understand the Bhāgavatam or other Vaiṣṇava literature, the reader would do well to read the work in its original language. The samādhī experience of Śrila Vyāsadeva, the mind of Vritrāsura, or the hidden meanings of the gopīs’ prayers may not be fully conveyed in a translation from the original Sanskrit. Kṛṣṇa is Himself the words of the Bhāgavatam; each Sanskrit syllable has unlimited potency and rasa, sufficient to overwhelm the materially addicted mind and bring about a revolution in consciousness. Aside from these transcendental benefits, the study of Sanskrit naturally includes the study of Vedic culture and history. It is a means to discipline the mind of the student, teach moral values and instill saintly character. What is there not to love about studying Sanskrit? 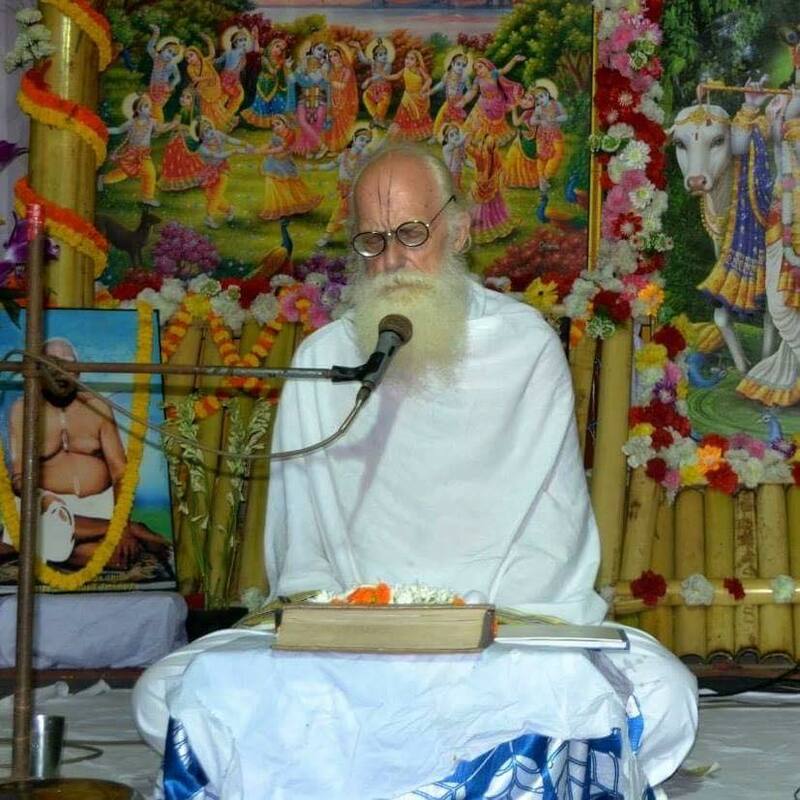 Jagadananda prabhu, our Sanskrit instructor, has a long history as both a Gauḍīya Vaiṣṇava scholar and Sanskrit instructor. He served as a Sanskrit editor for ISKCON Press in 1972, and then as the first Sanskrit teacher at the early ISKCON Gurukula in Dallas, Texas, USA. While living in West Bengal, he studied at the Nabadwip Sanskrit College. 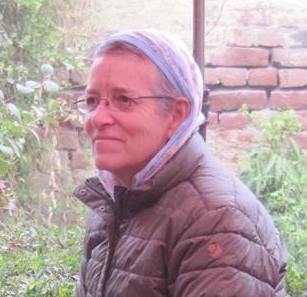 Jagadananda finally completed a PhD at the School of Oriental and African Studies (University of London) in 1992. His dissertation was on Śri Jīva Gosvāmī’s Gopāla-campū. More recently, he taught Sanskrit at the Swami Rama Sadhaka Grama in Rishikesh, which published his textbook, Sādhaka Pāṭhyam. This Sanskrit manual has been adapted for use by the Jiva Tirtha students and includes the morning prayers, principal verses from the Bhagavad Gītā, and basic Sanskrit lessons. The Jiva Tirtha Sanskrit manual also continues to undergo revisions and expansion as the needs of the students become clearer. The course will cover the most important aspects of the entire Sanskrit grammar. It will give students a working knowledge of the most important aspects of Sanskrit grammar together with core vocabulary and prepare them for the more advanced Sanskrit grammar studies taught in the traditional way. The goal of this course is to give a student the basic knowledge of the Sanskrit language which will enable him or her to study the original Bhagavad Gītā, Upaniṣads, Rāmāyana, etc., initially aided by word-by-word translations. This will be the first step to prepare a student to approach more complex Sanskrit Vaiṣṇava literature, such as Śrīmad Bhāgavatam with its commentaries or the Gosvāmīs’ works. More impressively, students who had given up on Sanskrit, including myself, have been revived and some second-year students have sufficient knowledge now to help with Sanskrit editing and the tutoring of other students. I would say that this is evidence of an effective teaching program, to produce students who are self-motivated to learn and teach others! What then are we missing? More serious students! Consider embarking on a life of scholarship and deep sādhanā by joining us for year three of the Bhakti-tirtha course! False humility is just one end of ahankara, pride being the other.